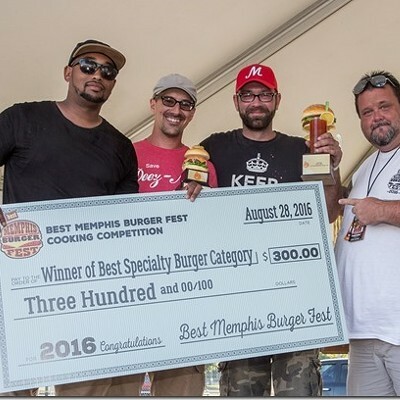 The 5th Annual Best Memphis Burger Fest took place on Sunday, Aug 28. 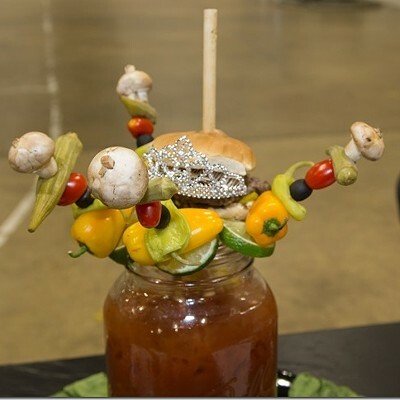 Over 40 teams competed in Bloody Marys and various burger categories, and also provided samples to the general public. The event was a fundraiser for Memphis Paws, a local non-profit dedicated to generating support for animal care and rescue organizations around Memphis. 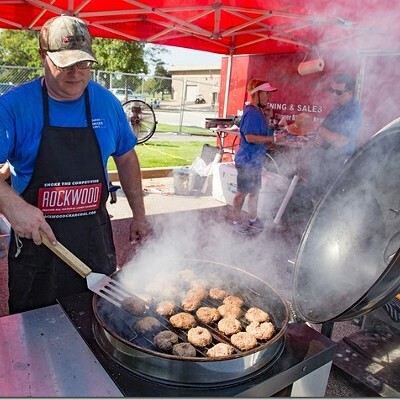 In addition to cooking burgers, the event also included a Kids Zone, a pickle eating contest, a slider eating contest, live music, food trucks, and a corn hole tournament. The answer to GWIE 109 is the Southwestern salad at Wild Beet Salad Co., and the winner is ... Michael Erskine! Tags: Guess Where I'm Eating, GWIE, Wild Beet Salad Co.
Jun Lee says the original plan was to open the second DWJ Korean Barbecue in Oxford, but then real estate agent Robert Taylor turned Lee on to the old Greencork space in Cooper-Young. The original DWJ is on Hacks Cross and is three times bigger than the Greencork space. Lee estimates that the new restaurant will seat between 30 and 40. Lee and his brother/business partner are doing much of the work on the new space themselves while still running the Hacks Cross restaurant. Lee says the Cooper-Young DWJ menu will offer about half the dishes that the Hack Cross one offers, but diners should expect such signature dishes as the Korean pancake, pajeon, and, of course, barbecue. And while Lee says he doesn't plan to compete with his Cooper-Young neighbors cocktail-wise, he does plan to serve soju, which he describes as a liquor that is like "a sake-slash-vodka." Tables will be outfitted with a grill/warmer that were ordered specially from Korea. "We'll try to follow a similar footstep as the old restaurant," says Lee. "It's a different scene here [Cooper-Young], a different crowd. We'll be as authentic as we can, but the style of service will be slightly different, a bit more faster-paced." Lee hopes to have the restaurant open in time for the Cooper-Young Festival on September 17th. The restaurant will be open seven days a week for lunch and dinner. 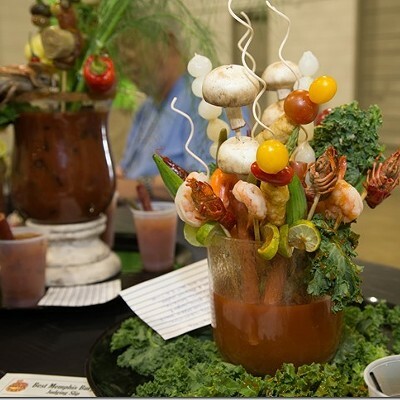 • Cristina McCarter of City Tasting Tours is looking to expand. She wants to offer the tour during weekdays and is looking for someone to help lead the tours. Interested? You can contact McCarter through her website, citytastingtours.com. The ideal candidate, says McCarter, is "somebody who loves the city." McCarter is also hoping to add a supper club on Thursday nights. • Indian Pass Raw Bar, based out of Florida, is opening its second location in the old Chiwawa space on Madison. 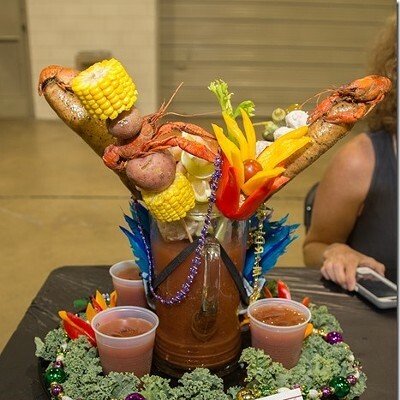 Ralph Roberson and Ralph Rish (managers of the McNeill’s Indian Pass Raw Bar) along with two silent partners, with the agreement of the McNeill family decided that Memphis is the perfect setting for bringing a piece of old Florida history to Tennessee. The mix with Memphis cuisine and music will be a great combination. The Chiwawa building location on Madison Avenue at Overton Square will be the perfect place to re-create the rustic atmosphere of an old Florida seafood dive, and to treat Memphis to a great, fun experience. Seafood, music and sports in a great, fun, casual place. The Chiwawa building already has a rustic appearance and with modest renovations we can create a great atmosphere for a raw bar. The deck is a big part of why we selected this building. The outside deck is important to our raw bar concept. A place in the outdoors where we can enjoy great seafood, live music, sports on big screen TVs and other events. This will be more than just another place to eat. We are still in the planning stages for design and hope to begin renovations within the next few weeks. We hope to open around the first of December. There is an old family tie to Tennessee. Mr. James T. McNeill Jr. (family patriarch – deceased 2010) attended the University of Tennessee while training to be a bomber pilot in WWII. The McNeill legacy returns to Tennessee. • The Farmer is now open in the space formerly occupied by Just For Lunch. Check out my vegetable plate above. 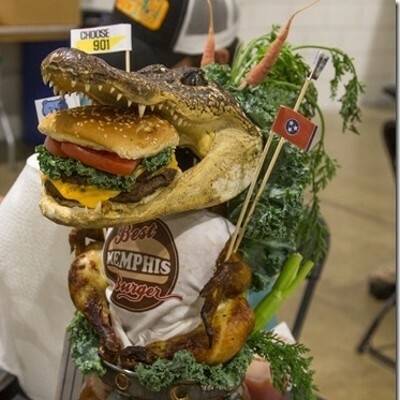 • Porktoberfest is set for October 7th-8th at the Memphis Botanic Garden. 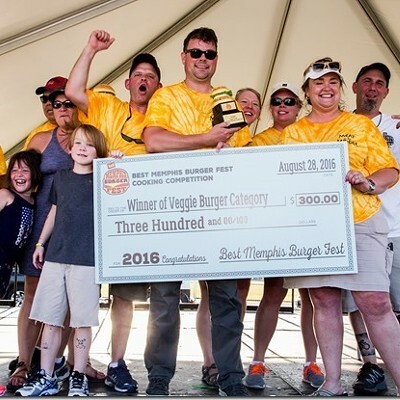 The event will feature a barbecue cooking contest, food trucks, and pork-centric dishes from 20 area restaurants. • Hollywood Feed Bakery recently opened at the Union Avenue store. Offered are fresh-baked biscuits, cookies, and cakes, such as the strawberry almond cake ($20) pictured above. Everything is wheat- and white sugar-free. * The 2nd Annual Wine on the River is set for October 1st. The event benefits Youth Villages. and features a "World Tour" of wines. Tickets are $49. The answer to GWIE 108 is a) Gay Hawk Restaurant and b) Loflin Yard, and the winner is ... Actually, no one got this one. I think this is the third time this has happened. The owners of Kooky Canuck announced they are moving their downtown restaurant after 11 years. The restaurant is moving next door, to 87 S. 2nd. The Dankos expect to make the transition to the new location at the end of October. The new restaurant space requires a full build out and Graham Reese Design Group will play a large role in the design. The Dankos plan to keep many of the original lodge elements of the restaurant while giving it a more updated look. There are plans to expand the number of draft beer offerings which will include more local brews and there will be some menu changes along with the addition of a brunch menu on Saturdays and Sundays. The new space will also feature several large doors which open up to Second Street creating a patio-like environment. The Dankos will be hosting several large events to launch the new location. Sushi Jimmi's Jimmy Sinh confirmed plans for a new restaurant at the old Wendy's on Poplar across the street from Senses. He hope to have the restaurant open by October or November. Sinh says the restaurant's menu will be the same as the food truck, but there will be more wiggle room. He envisions having a Taco Tuesday or throwing in specials like fajitas. Sinh is also starting a second food truck that will serve Vietnamese sandwiches (!). He hasn't settled on a name for the venture yet, but he's been busy training staff, so expect to see it on the road soon. • Pink Diva Cupcakery and Cuisine is switching its focus and will now concentrate on catering and its food truck. The restaurant on Florida is now closed. Pink Diva's Cassi Conyers says she hopes to have the food truck operating in the next month. She says that traffic to the restaurant was often slow. With the truck, she can go to the traffic. Also in the works is a vegan cupcake mix. She says a mix is much easier to ship than a cupcake. "I'm taking it in a new direction," says Conyers of Pink Diva. "In the last year and a half, I've accomplished a lot." Pink Diva caters corporate events, birthday parties, etc. More info here. • Frost Bake Shop will hold a ribbon cutting for its second location in Collierville at 1016 W. Poplar on Tuesday, August 16th, 11:30 a.m. The new shop is considerably bigger than the East Memphis location, and there are plans for classes as well as private parties in the space. • Celtic Crossing recently announced some changes, including the installation of a new mosquito repellant system (!). They also have a couple new menu items (Irish nachos! ), a seasonal wine menu, and a new manager, Christopher Darling, who has an eye toward efficiency. Tags: Sushi Jimmi, Pink Diva Cupcakery and Cuisine, Frost Bake Shop, Celtic Crossing, Jimmy Sinh, Cassi Conyers. • 4Dumplings has shut its doors. After a year's preparation and two and half years of operation, we have decided it's time to close 4Dumplings. We are proud of what we had done for our community, proud of the small impact we had made for eating clean, but we also realized that being the restaurant owner/ operator is a little too much of a job for us... We have sacrificed too much meaningful family time together. We are sad that we started something wonderful, but couldn't carry it to the end, but we know we need a more balanced life so we can do some other things that could be even more important and more rewarding from many levels. 4dumplings has taught us so much and we will always be grateful. Last but not the least, we want to thank all our guests for allowing us the opportunity to serve you!!! • Another Broken Egg opens its second Memphis location on August 8th, but biscuit beignet lovers can get an early and free (!) taste on Friday, August 5th, 9 a.m.-1 p.m. and Saturday, August 6th, 9 a.m.-1 p.m. Both days are set as fund-raisers. Friday's proceeds go to the Ronald McDonald House and Saturday's go to St. Jude. You can book reservations at NewATABE.com. • The second BreakFest has been set for September 24th, 10 a.m.-4 p.m., on Broad. 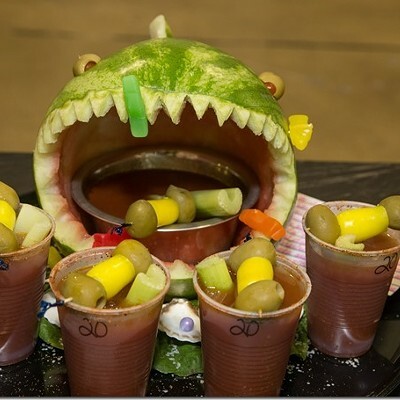 Includes a bloody mary contest and a waffle bar (!). Proceed go to the Urban Bicycle Food Ministry. • Have you checked out Blooming Bubble Tea at the Wolfchase Mall? Blooming Bubble offers an extensive list smoothies and milk teas, plus sno cones and macarons. You also get a choice of tapioca pearls or popping boba (and, yes, these pop in your mouth!). 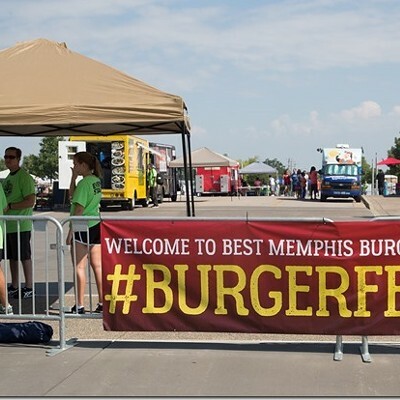 • The first Fourth Bluff Friday is set for August 12th, 4:30-9 p.m., at Memphis Park near the law school. There will be a pop-up beer garden courtesy of Tap Box and food from Monkey Train and Stick'em. Continues on the second Friday of the month through October. 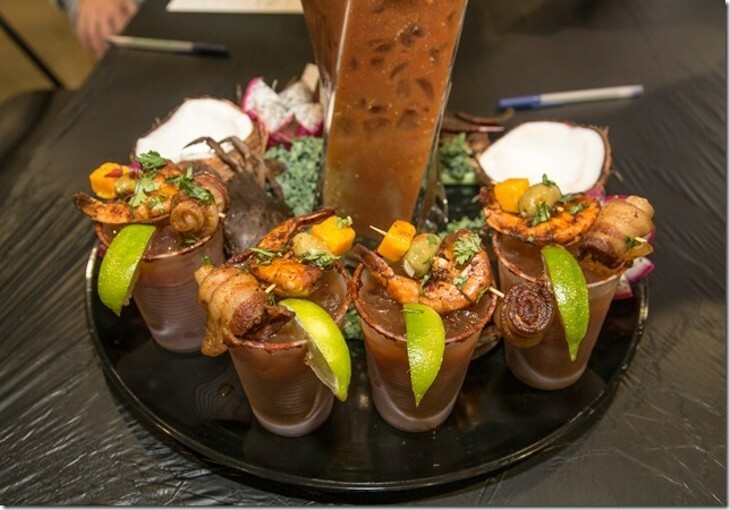 • Paradox Underground is a new dining club from chef Jimmy Gentry. The first event is set for August 26th, and the dinner will include five courses plus wine, cocktails, and beer. There will be at least five dinners a year, with special guest chefs cooking with Gentry. • 99 cent Soul Food Express is now open. All dishes are served a la carte. Guests make their way through line, pointing out what they want, sorta like Picadilly. Seen above is the lima beans, mac n cheese, fried green tomatoes, and a corn bread muffin, about $6. A two-parter this week. One old, one new. The first person to guess BOTH places where I'm eating wins a fabulous prize. The answer to GWIE 107 is Gus's fried chicken, greens, and mac n cheese at Gus's, and the winner is ... Elizabeth Ennis! Thanks to Cristina for the image!